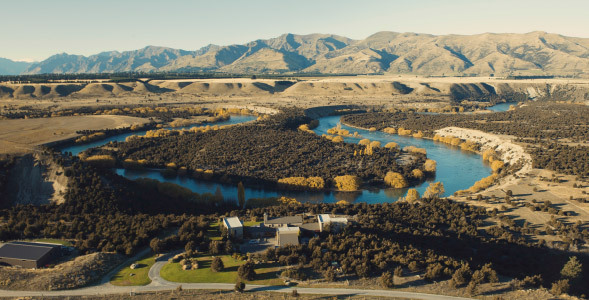 Exclusive Adventures New Zealand is a high-end hunting, fishing and adventure company based in Wanaka, a small picturesque town nestled seductively close to the stunning Southern Alps of New Zealand’s South Island. 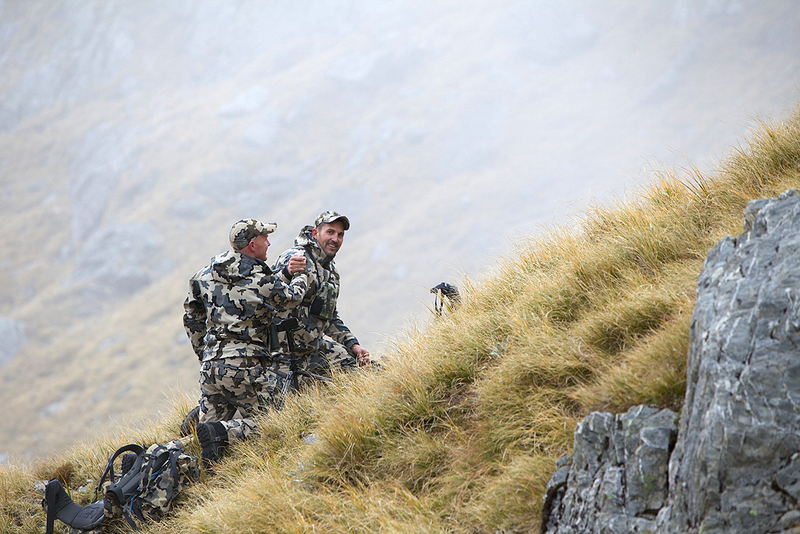 Owners, Shaun Allison and Ben Ferguson, are devoted hunters, fishermen and entertainers. They thrive on sharing adventures with new people and creating life long memories while doing what they love. Shaun and Ben started Exclusive Adventures in 2011 as a way to share their passion and knowledge with people from all around the world. 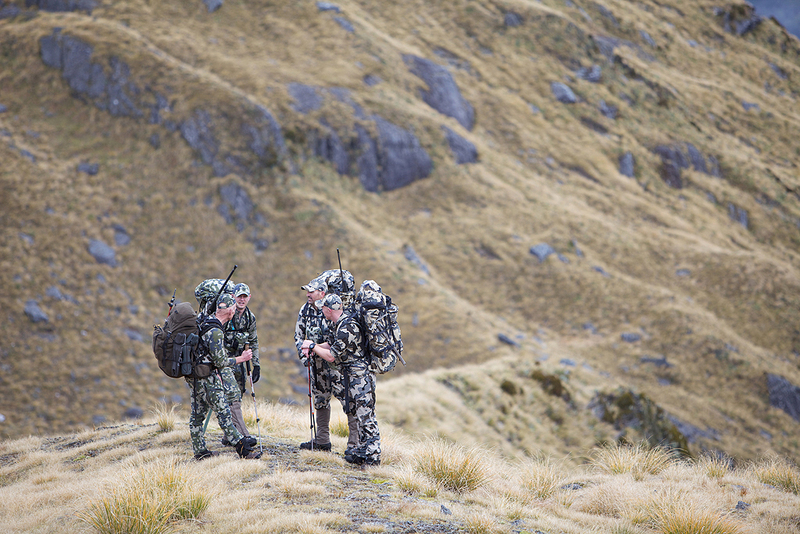 With access to the best hunting and fishing locations New Zealand has to offer, coupled with the exclusive use of the finest lodgings and professional staff, they pride themselves on providing guests with a safe, successful and unforgettable adventure. 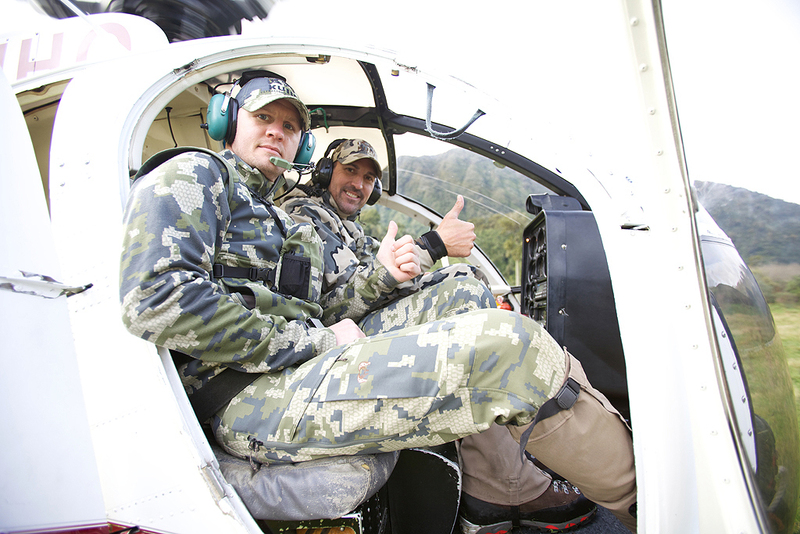 With over 20 years collective experience in the hunting and fishing industry, Shaun and Ben offer personalized packages for each individual client to create their ultimate adventure. Exclusive Adventures will take care of all the details and can organize equipment, accommodation and travel arrangements to ensure a relaxing and enjoyable trip before, during and after the adventure. 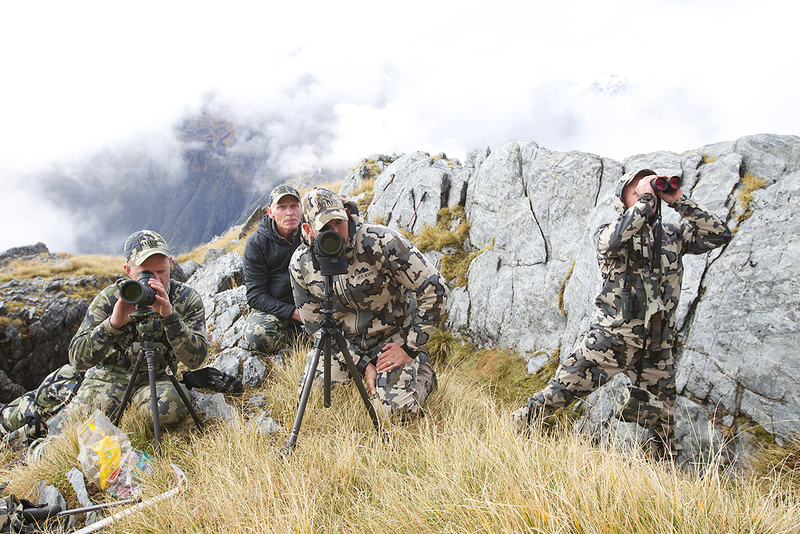 Brendan Burns and I booked a hunt with Shaun to backpack hunt for Tahr, Chamois, and Red Stag in the very rugged Southern Alps. 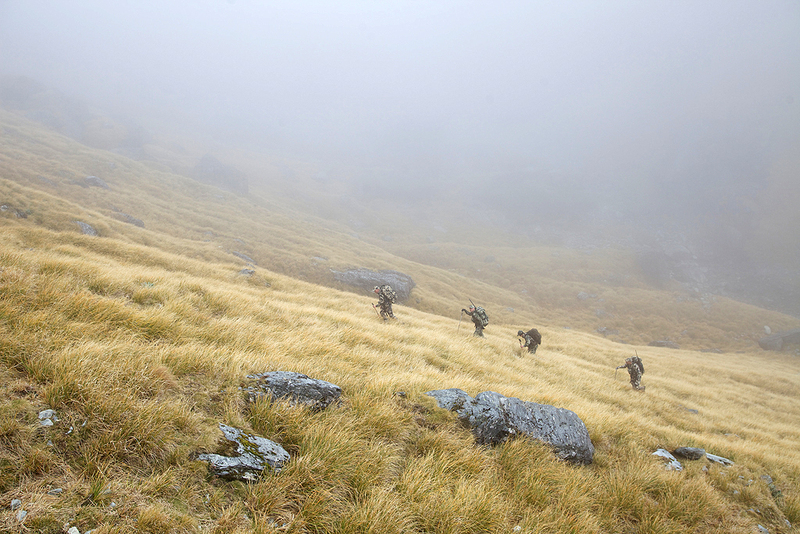 We hunted May 17th -27th, the peak of the rut and the middle of Fall in New Zealand. 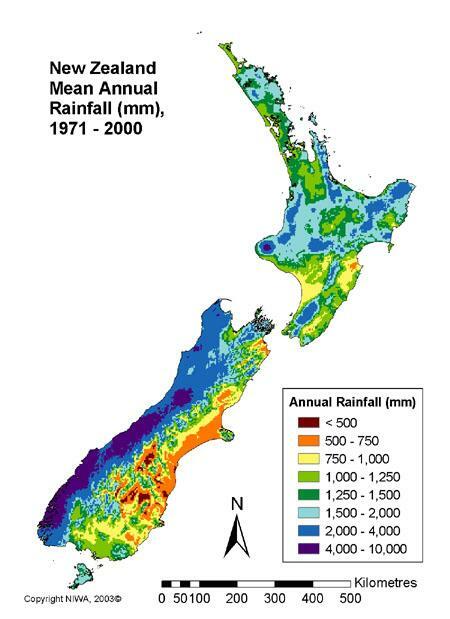 The West side of the Southern Island has average rainfall in excess of 30 feet per year, making it one of the wettest places on earth. 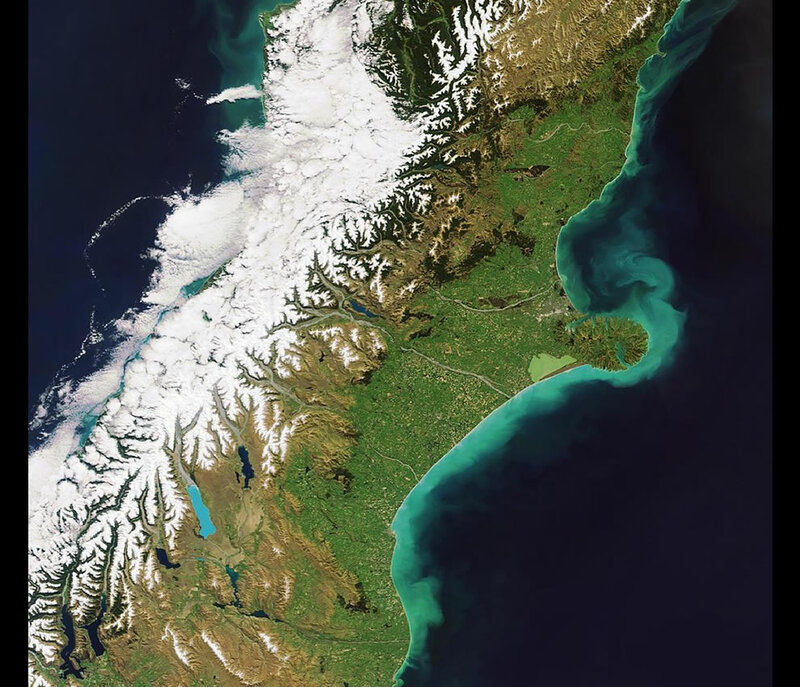 New Zealand has a very unique climate mostly because it is made up of essentially two large islands and weather comes in very quickly out of Antarctica across the Tasman Sea and slams into the Southern Alps that rise up straight out of the ocean to over 12,000 ft.
New Zealand is very unique climate and creates a very dynamic range of habitat that rises straight from the ocean and beach,into rain forest and straight up to above timberline and glaciers and rock. 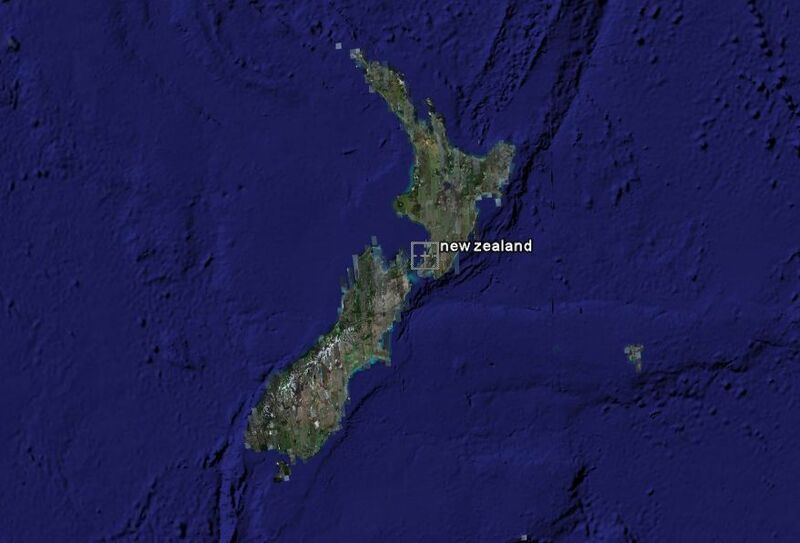 San Francisco to Aukland is 6,535 miles. I was surprised to find direct flights from Los Angles and San Francisco as low as $1,000 round trip. The flight time is just over 11 hours. Most flights leave at night and you arrive in the morning. Dinner, a movie and fall asleep and you are literally there. It was easier and significantly cheaper to get to there than I ever expected. Shaun picked Brendan and I up in Queenstown, a very nice resort town on the Southern Island. 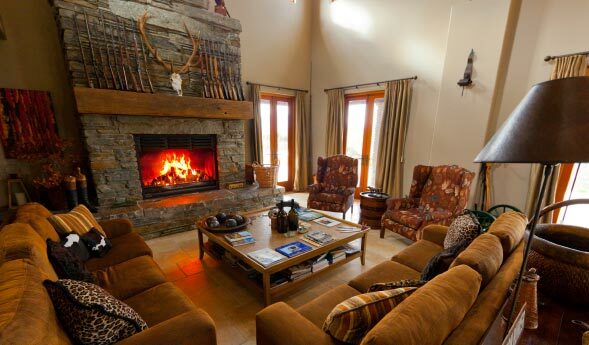 We headed to The Oxbow Lodge, which is not quite what we would all refer to as a “Lodge”. 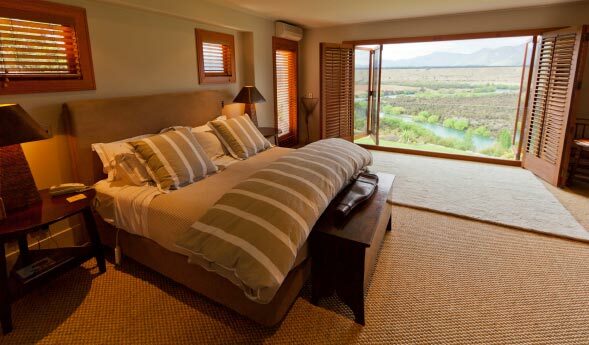 The Oxbow is absolutely first class, from the facilities, view and the owners, Lloyd and Julie Fergerson, who are exceptional hosts, incredibly generous and make you feel very welcomed. 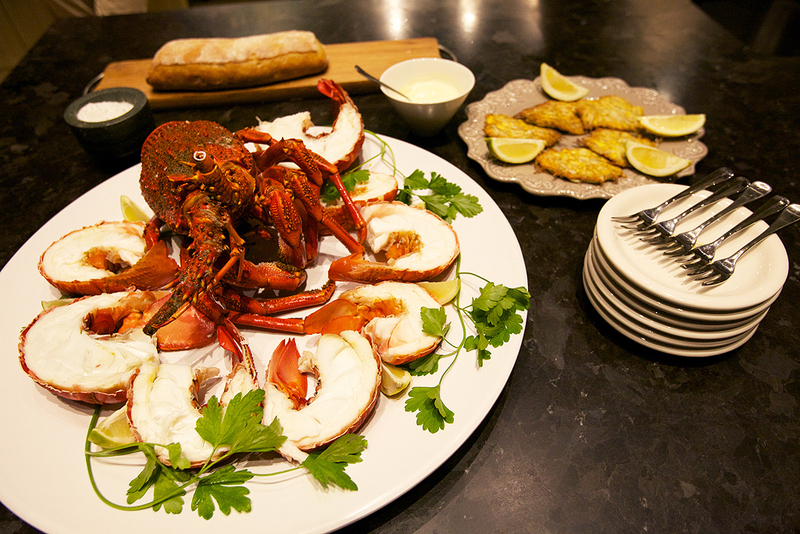 After the lobster and roast for dinner, which was amazing, we began gear prep we and headed to bed. We were up early the next morning and drove to the West side of the Island to meet up with Shaun’s good friend and Guide, Bruce Barnes. Bruce is a quite simply a living legend. 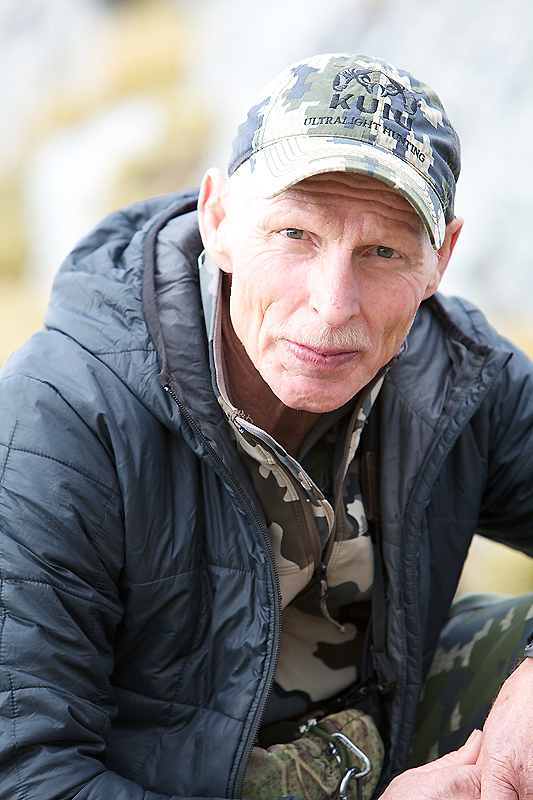 He has lead a life of adventure from mountaineering, white water kayaking, to dedicated light weight Mountain Hunting. He has Kayaked all over the world and discovered the West Coast of New Zealand as an international white water Kayaking location by doing 17 of the first descents. He is an instructor for mountaineering, kayaking, hiking, rock climbing and more ,with an average of 120 nights a year spent in a tent. 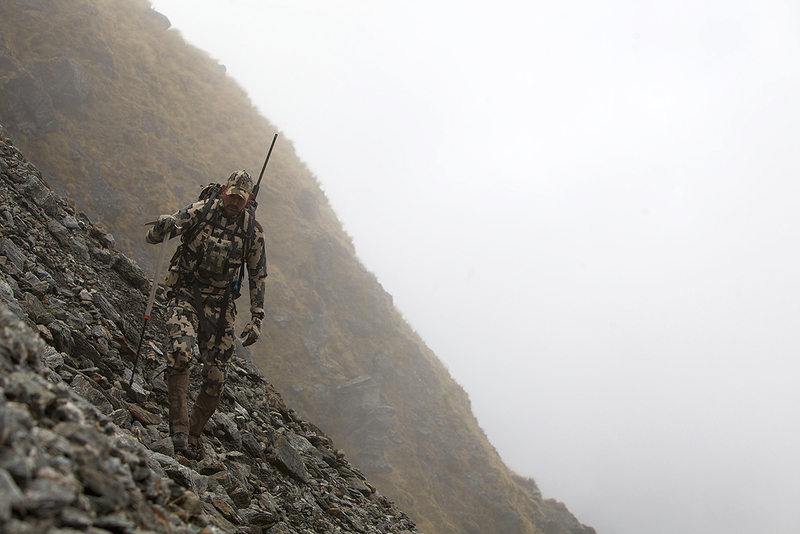 His life time of hunting the mountains with the bow makes him extremely knowledgeably about the game and the behaviors. 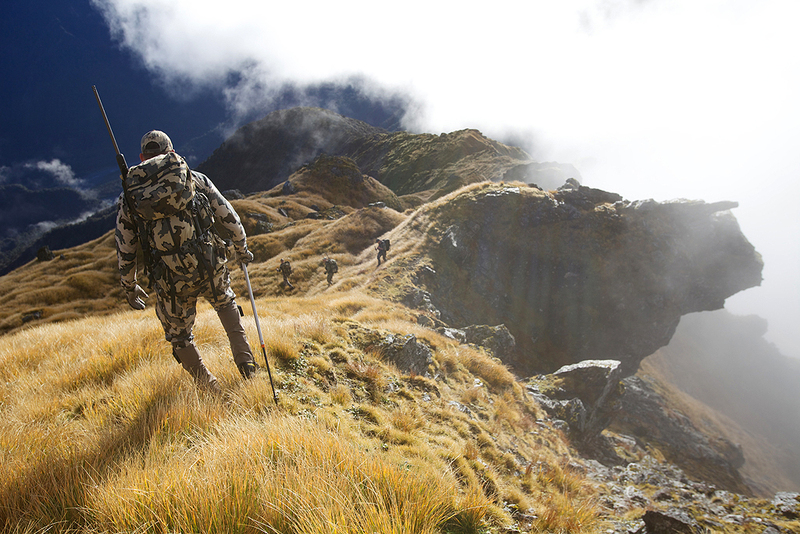 Combine this with his unmatched mountain experience, enjoyable character, and safety makes him invaluable professional hunter for Exclusive Adventures New Zealand. 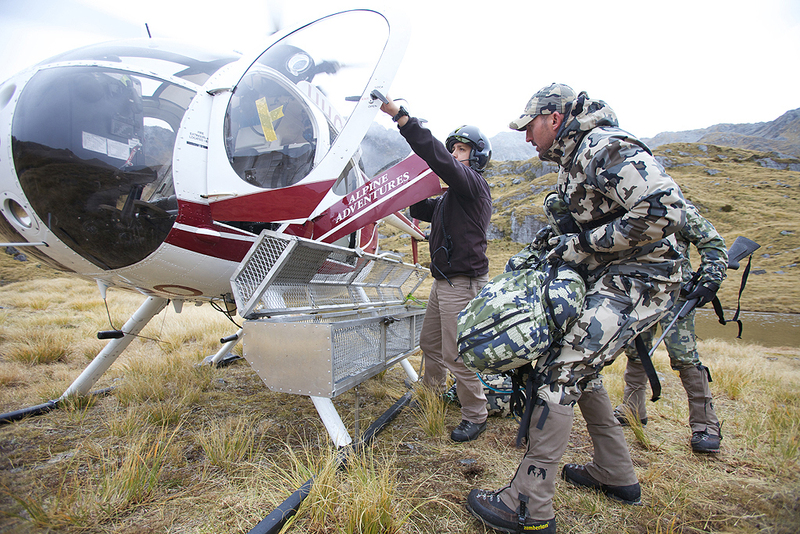 We loaded up our gear and food for 4 days into the Hughes 500, and flew into a wilderness area that allowed us to land only at a designated landing spot for the helicopter. 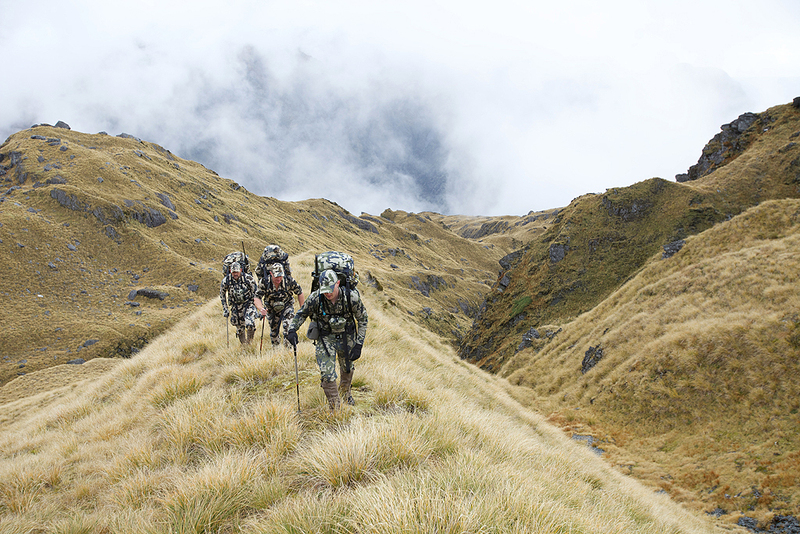 We loaded up our packs and began heading south up a long ridge and then over a high pass that would take us into the next drainage where we would set camp and hunt for the next couple of days. 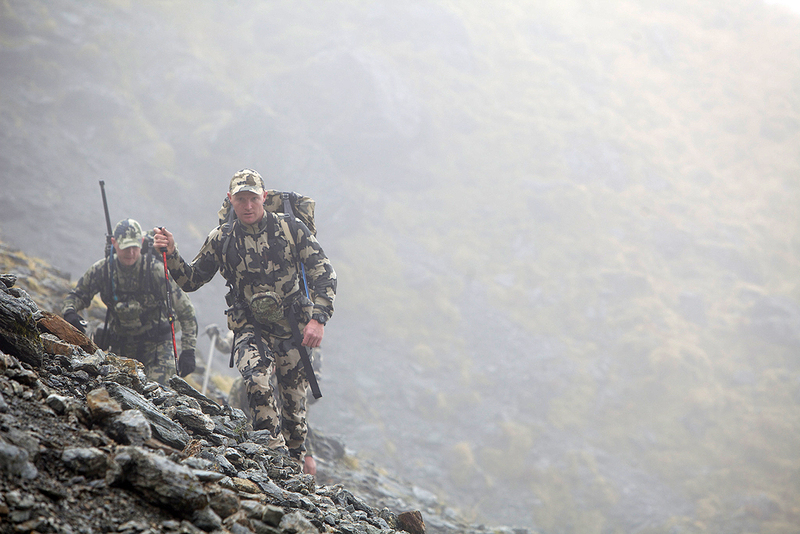 We set up our tents in small draw just below a large ridge, unloaded our supplies and set off to glass for Tahr. We are hunting the peak of the rut and it did not take long before we located a bull with nannies in a basin 700 yards across from us. 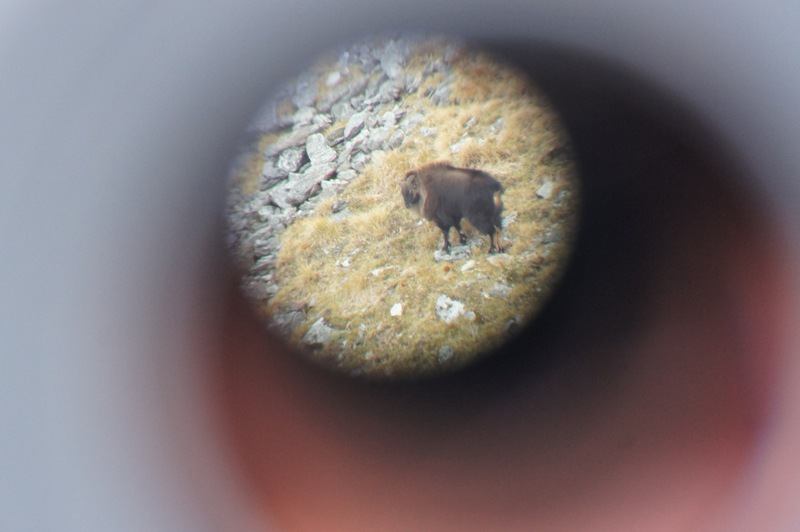 We set up the scopes to get a closer look at the bull. “Hey Mate, that is a good Shaggy at least 12 inches,” Shaun and Bruce pointed out. Brendan, who is a sensitive guy, looked at me and said “he is all yours”. I did not argue because I never pass up a good opportunity on the first day or two of a hunt. The stalk was on. Shaun and I took a round about approach to get the wind and elevation and coverage at the top end of the drainage. 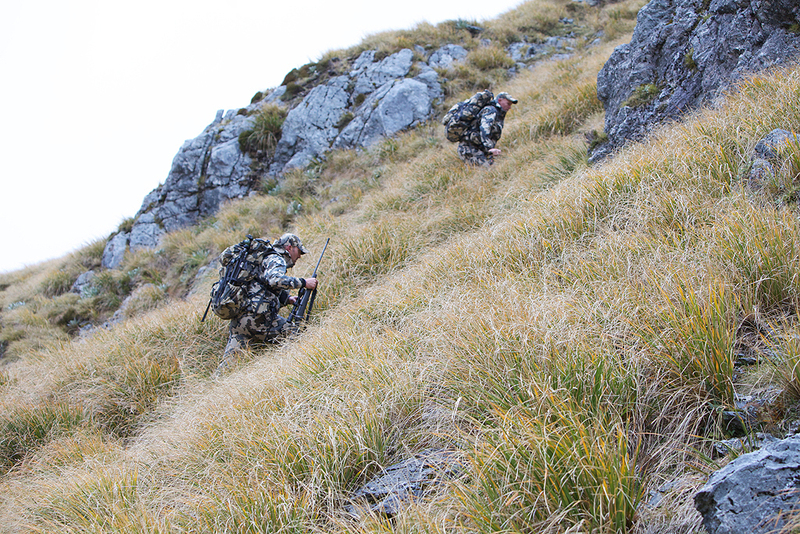 We dropped down the drainage and over a small ridge getting us to 137 yards from the Bull. “Hey Mate, he is a good one” advised Shaun, “…take him!” The Boswell 300 WSM hit him through the front shoulder and he was down. It was a fantastic stalk and set up by Shaun on a REALLY good bull. What a start to the hunt! 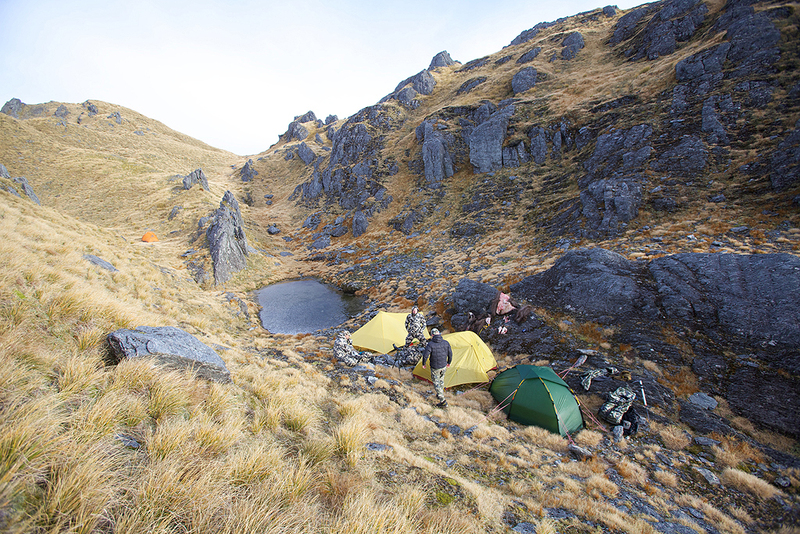 After photos, field dressing and a long climb out of the basin, we arrived to camp after dark and in a heavy rainstorm. We were up before first light, but fogged in with a light drizzle still falling. We piled under Bruce’s Sil-Nylon tarp and sat out the fog drinking coffee and telling hunting stories. 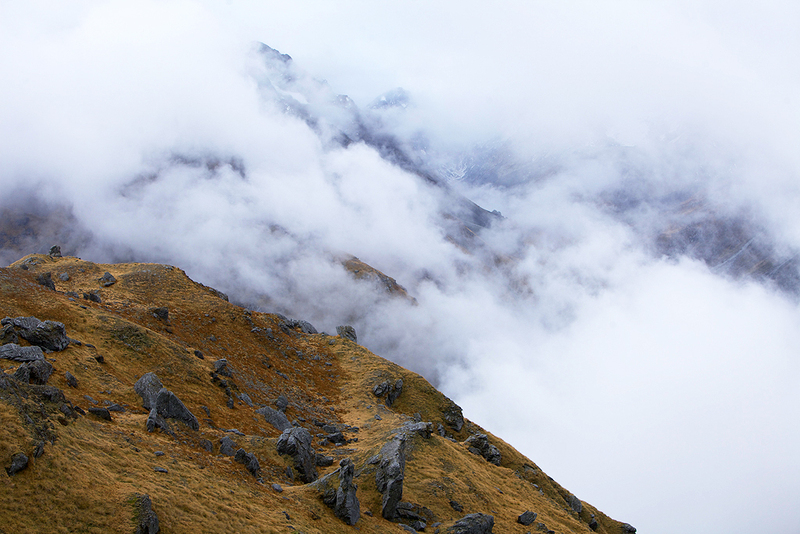 After a couple of hours, the fog lifted and we headed down the ridge below camp to glass for Tahr and Chamois and we spotted a couple of groups of Tahr on a distant mountain across a huge drainage. 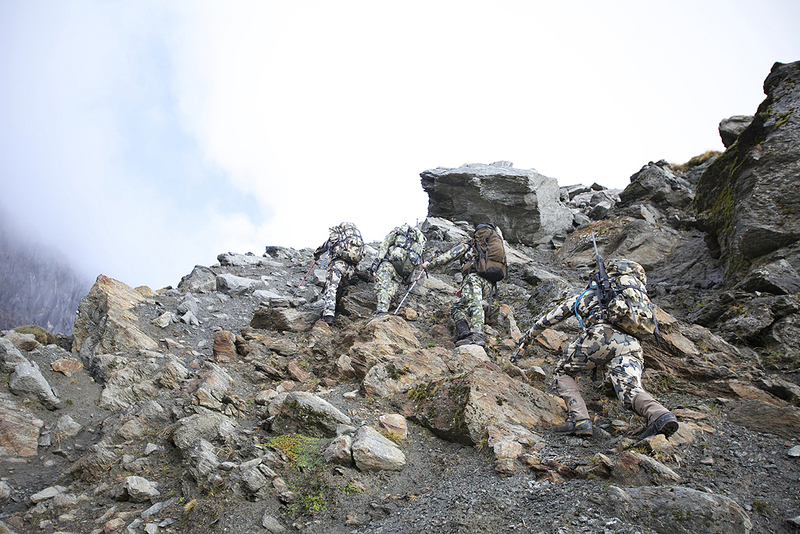 We made a very steep and technical side-hill across an almost vertical face of shale, rocks and hummocks to get to the Tahr for the evening hunt. 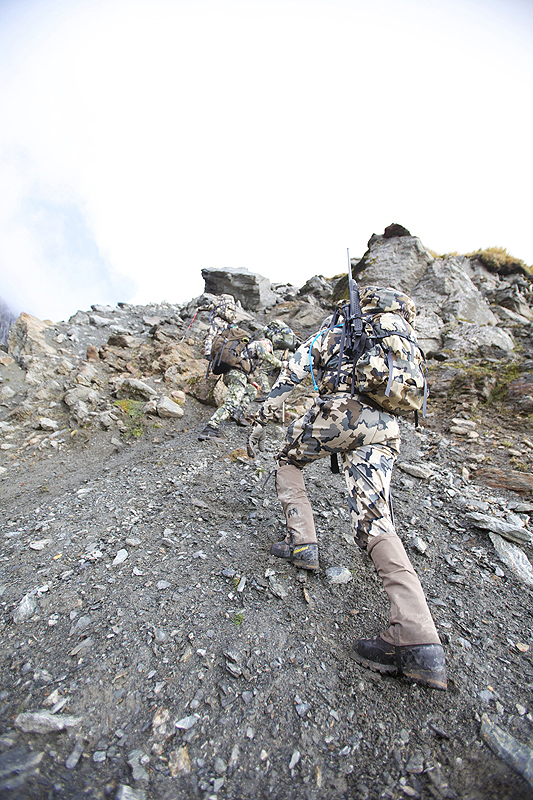 This was an incredible test for the new KUIU Zamberlan Boots I was wearing. They really shined in this steep country giving me a secure platform on an insecure mountainside. 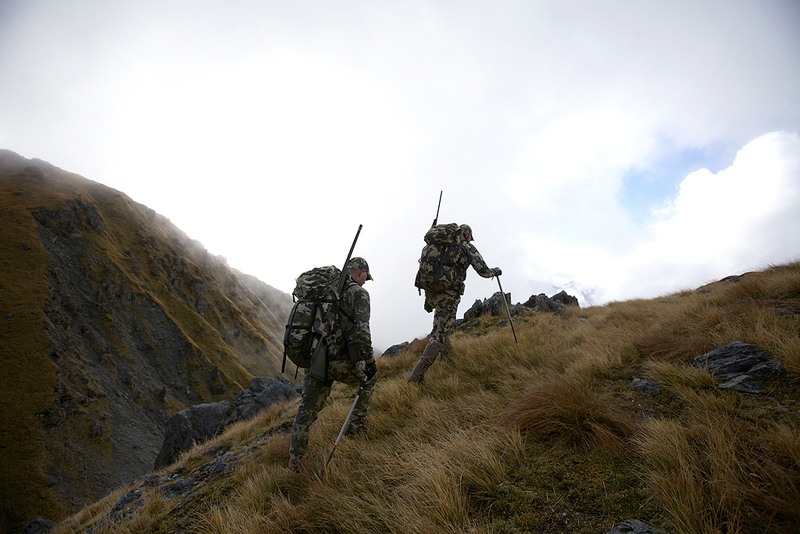 The Southern Alps are the steepest and most technical mountains I have hunted. 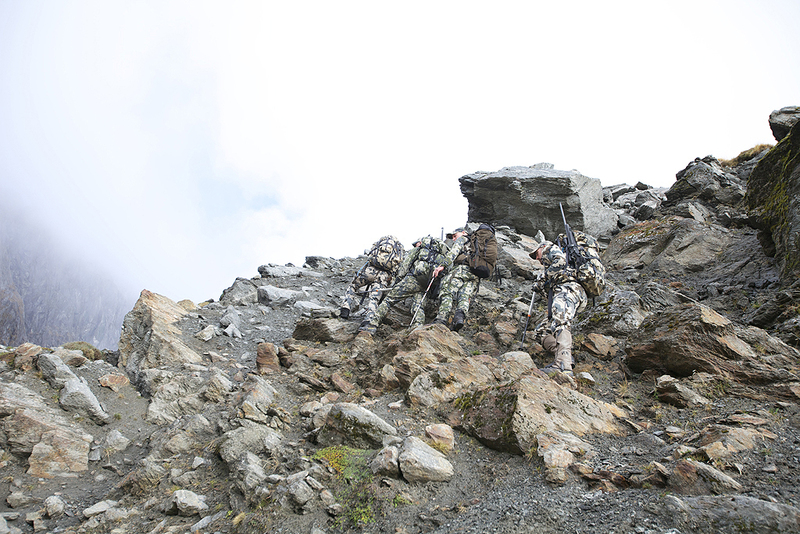 The terrain is very steep, unstable and the hummock-covered slopes are incredibly dangerous. If you slip and fall on the wet hummocks it is almost impossible to stop. 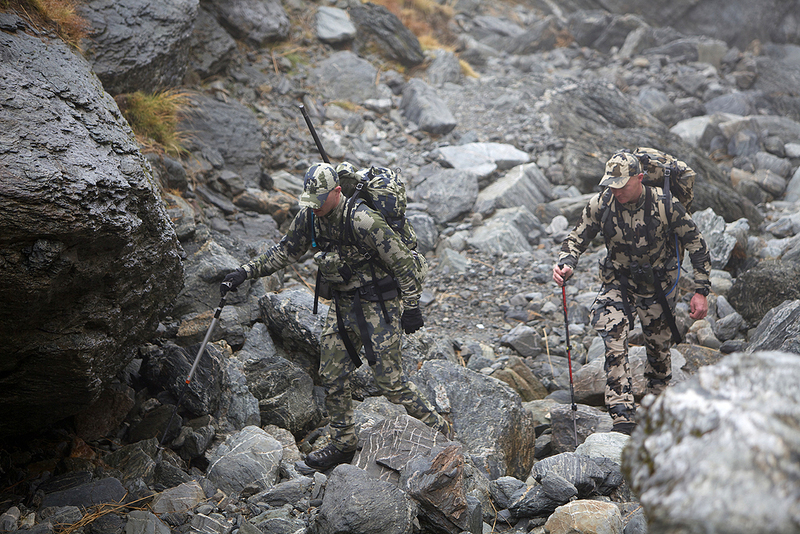 We all carried Ice Axes, trekking poles and Crampons the entire hunt. Every step had to be carefully placed and secured. It made this hunt a very good mental and physical test. The evening hunts are very productive in the rut. Bull Tahr, or “shaggy”, chase and posture nannies. Bulls have a thick long coat of hair that they “fluff” up to make them look as big as possible. Big bulls are significantly larger than Nannies and look up to 4 times larger when rutting and fluffing up. 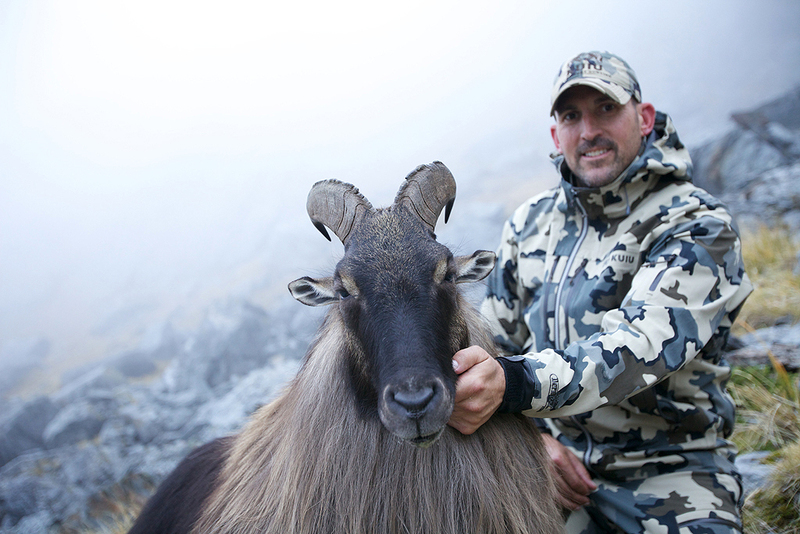 As the evening approached, we located several groups of Tahr with nice bulls and a couple of real good ones according to Shaun and Bruce. We found a very respectable bull below us with a group of nannies in a very approachable spot for a stalk. It was Brendan’s turn. We quickly closed the 700 yards down to 100 yards. 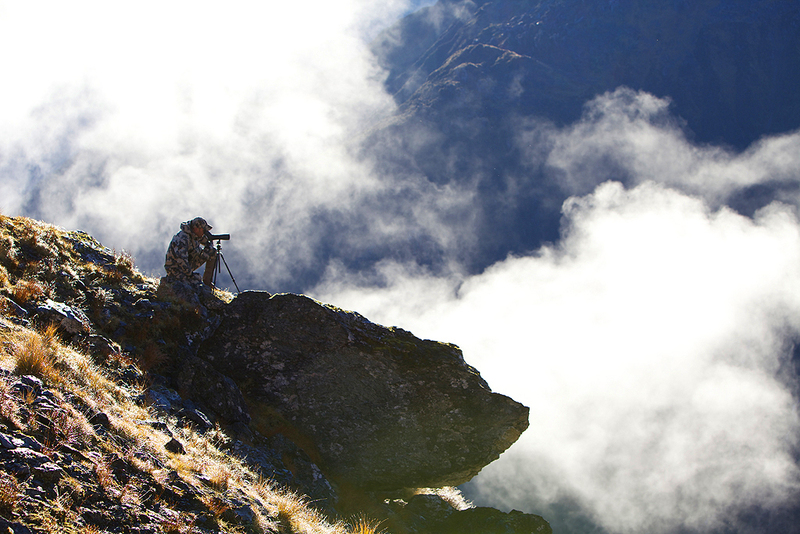 The stalk put us on the edge of a cliff looking directly into the small basin we last saw the Tahr. The fog had rolled in and we could not see 25 yards in front of us and the waiting game continued for almost 30 minutes. Finally the fog began to lift and there they were, two bulls and eight Nannies. Shaun told Brendan to take the larger bull located above the herd. The bull was down immediately from a well-placed shot through the shoulder. On the hike back to camp we spotted Tahr above us in the rocks and cliffs with the night was fast approaching we only watched them in the spotting scope before our 2 hour climb back to camp. Excellent write-up! 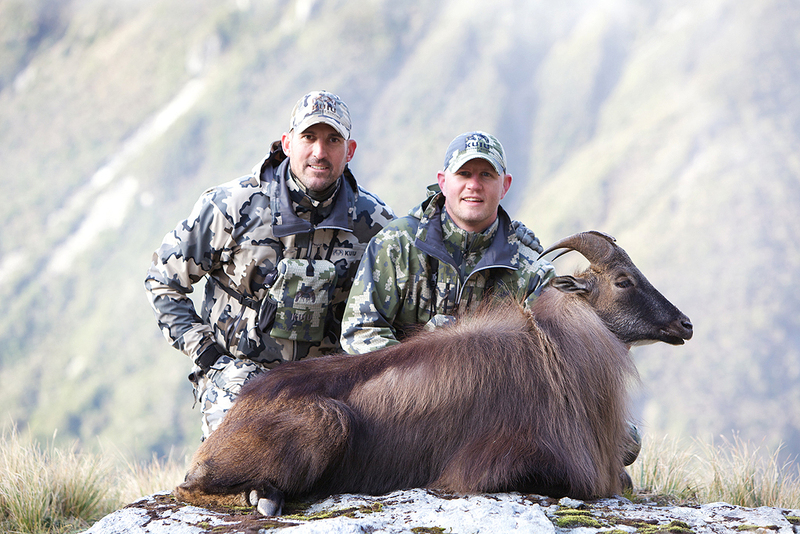 Great photos and some beautiful Tahr! Well done! There are Tiburon gloves out there or is that a typo on the gear list and should be Yukon? 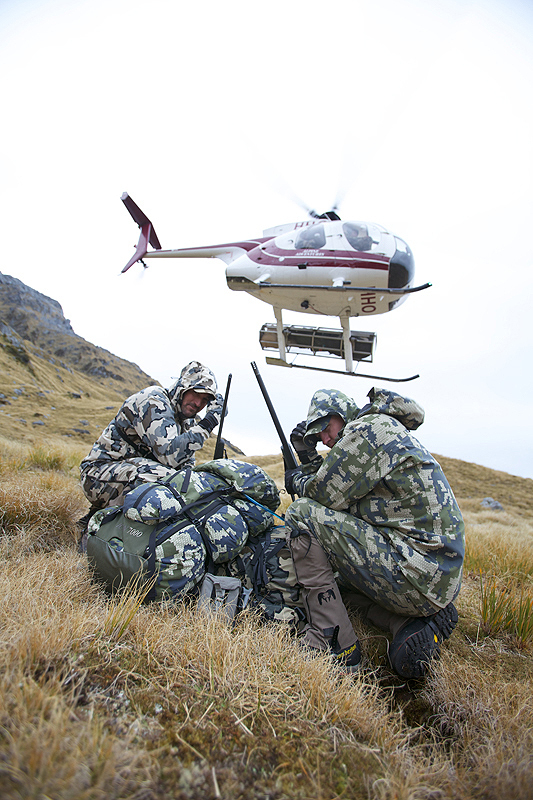 Also noticed a kuiu tent on the gear list…. More information on the Tiburon Gloves next week. The Tent is a new development project I am working on with Easton and Toray and the #1 Technical Tent factory in the world. More on this to come later. It looks like the lord of the rings! Epic place, scenery is unreal! Pictures are amazing.. Very interesting read. Were they large valleys? 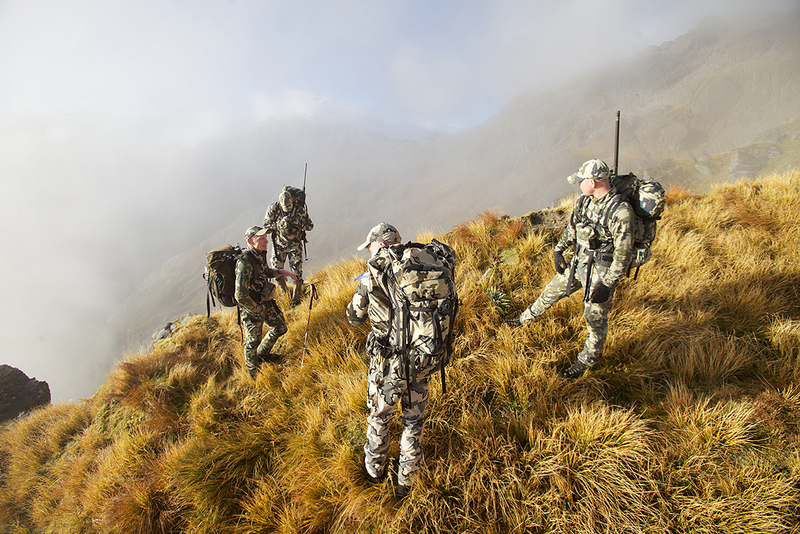 Or you could hunt from the top without crossing valleys? The country looks steep, if the thar rolls down…puff! Chamois and thar were together? Awesome! Great photos and story and photos as usual! I’m pretty impressed by having your pack weight sub 15 pounds for the 4 day trip. I want to hear more about that Kuiu tent. Looking forward to the rest of the story! I wore our Merino 185 tops and bottoms the Yukon Jacket and Pant. I had Super Down Hooded Jacket & Pants in my pack and that was it. The sub 15 pounds did not include food or water. The Tent is a development project I am working on in a collaboration between Easton and Toray. More to come on this later. 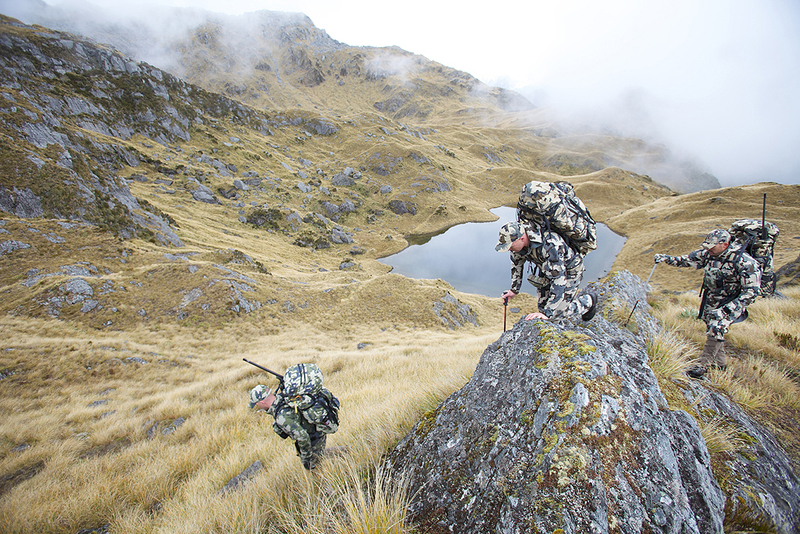 We were landed on a very large mountain and we were able to do all of our hunting on this mountain and did not have to drop down and cross to another mountain, which was good because this would have taken us a couple of days. It is an amazing place! I cannot wait to go back. Thank you! All photos were taken by Paul Bride. Paul Bride is rocking your trips! Very definitive style and composition! Very great photographer choice and a fellow canuck to boot! That will make for some good daydreaming this Monday morning. Great post, the pictures are ridiculous. Great write-up and photos. 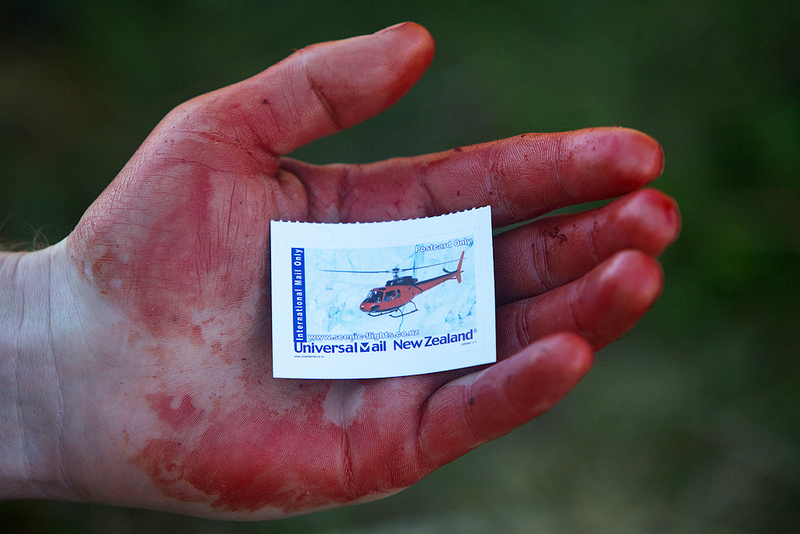 It has been almost 10 years since I was last in New Zealand. Your photos brought back a rush of great memories. Thank you. I need to get back there soon. 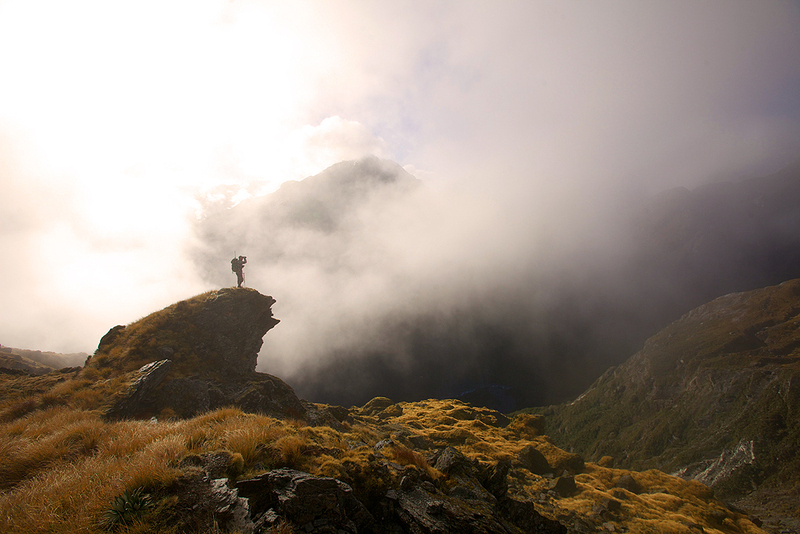 For those who have not been to NZ…it is truly a spectacular place. Photos simply don’t do it justice. The hospitality and good-natured spirit of the locals make it all the better. Well said JT. It should be on everyone’s bucket list for sure!! Where did you see the gear list? Did you find it Trevor? 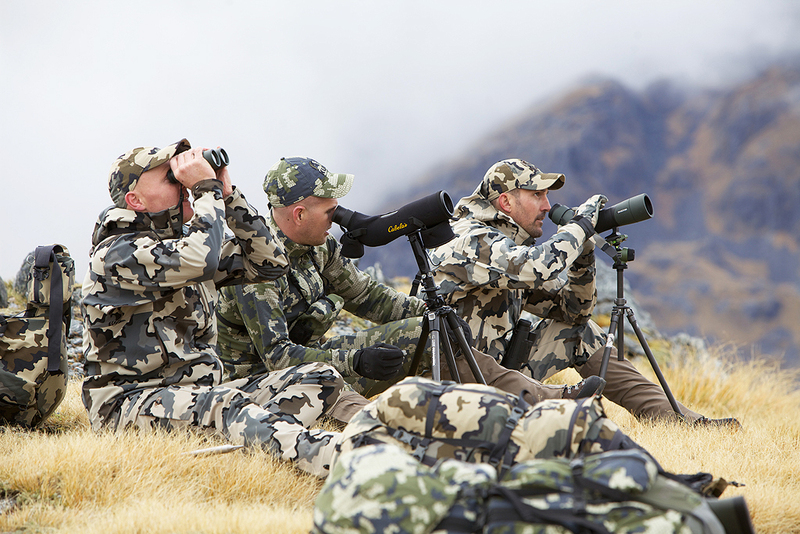 New zeland and Thar hunting ! a dream of kid ! This animal, a heck of mountains ! The photos are superb. Those just before the text “After a couple of hours, …… across a huge drainage.” gives an incredible atmosphere. 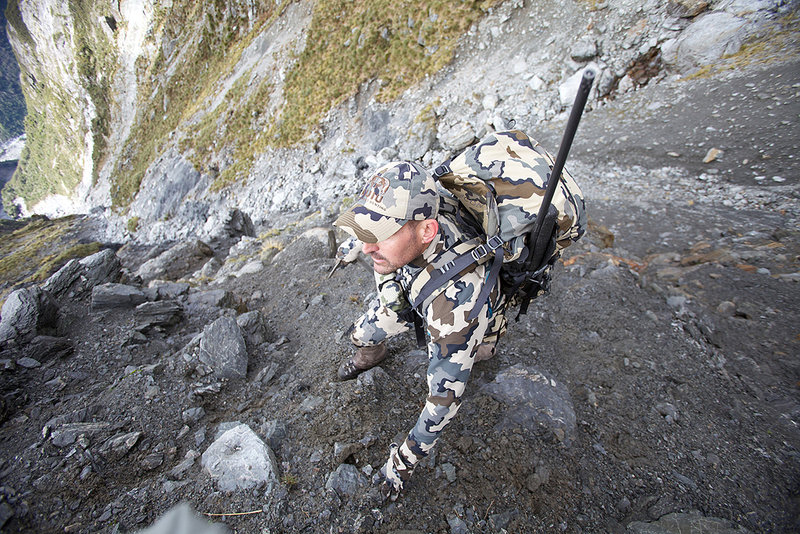 Thumbs up on the tiburon gloves, the KUIU sleeping bag and the KUIU tent. We’re all looking forward to these new innovations! WOW, what an excellent first part. Can’t wait for the second. 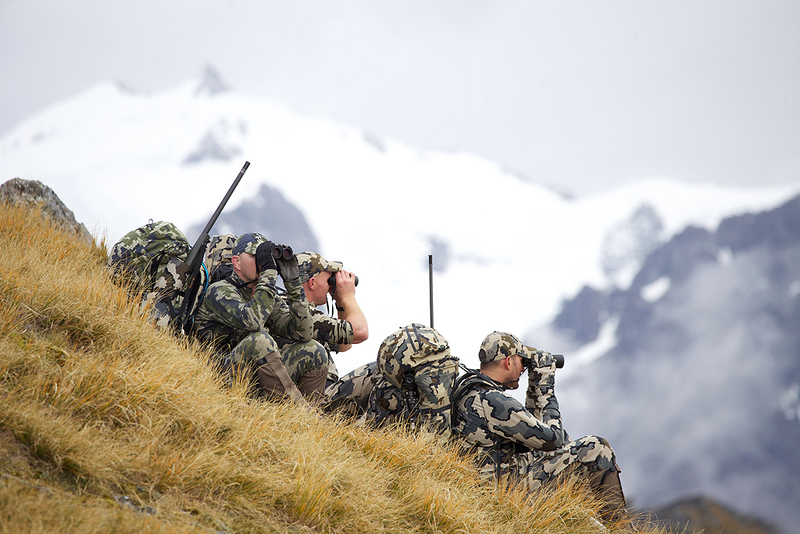 New Zealand seems like a dream area to hunt in and now i am definently holding out for those boots! Thanks Mike! These boots are really impressive. Surely that’s got to be a misprint on the weight of your rifle. 30.1 oz? I’ve heard of lightweight guns before but that would be a whole new dimension. It is a typo. My rifle weighs just over 6 pounds with the scope. That is a light pack list! Thanks Matt. The Yukon Pants and Jacket make the clothing list very short! Great Adventure for sure! How did you like the Suunto Watch? Been thinking about that or the garmin one. Camo really worked in that country! I love the new Suunto! It works really well and is pretty easy to operate. 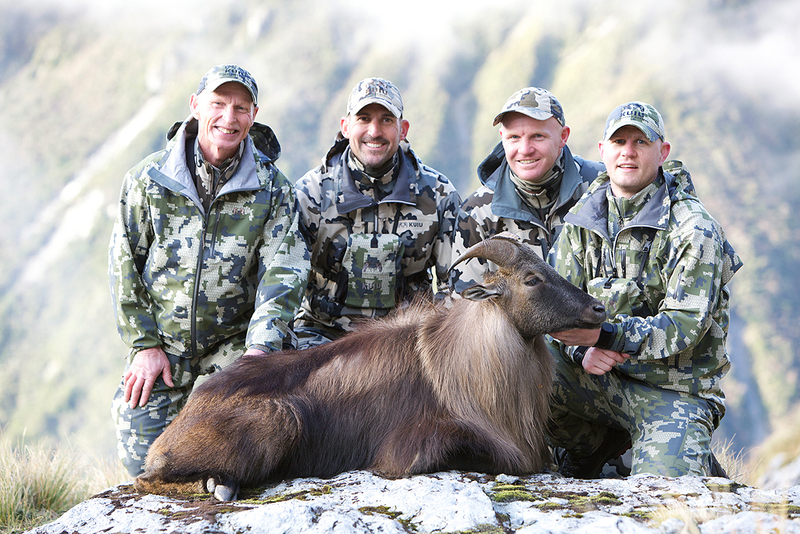 Great trip…with great gear….congrats to all of the KUIU team! Way to go, Brendan…..gotta take your bow next trip! Nice tease with the Kuiu tent! How is the sleeping bag working out? And I am still waiting on that long anticipated bino harness! Bino Harness will be here early next month. The sleeping bag is incredible. In regards to the tent, more to come on this later. It is a development project I am working on with Easton and Toray. 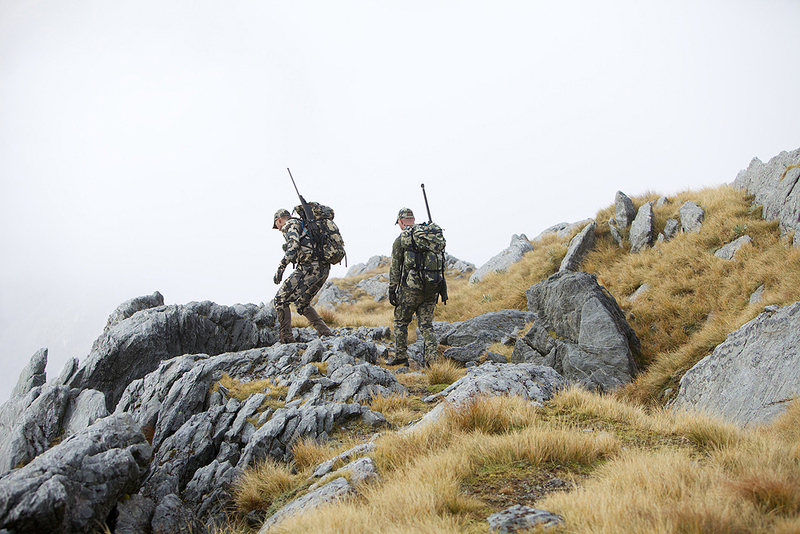 Fantastic hunt so far…Can’t wait to follow the remainder. Yeah, the gun weight appears off on the list. My Boswell .300 UL WSM weighs in at 7 lbs (112 oz.) with the scope (Zeiss 3.5x14x42)and sling. Yes it is a typo. My Boswell UL weighs 5.2 pounds before scope. Great hunt and also very nice bull!! One of favorite paces in the world love to go back, great hunt! Thanks Scott. It is an amazing place for sure! Looks like some incredible scenery, Jason. 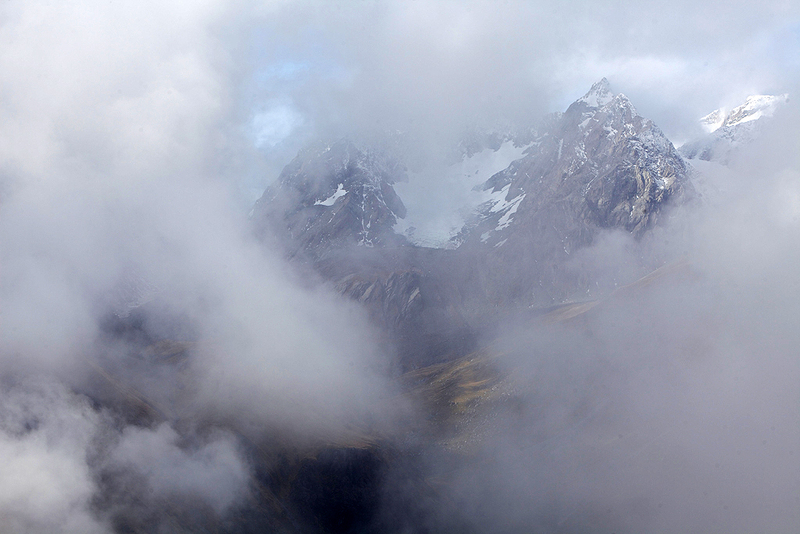 Love those rugged mountains. 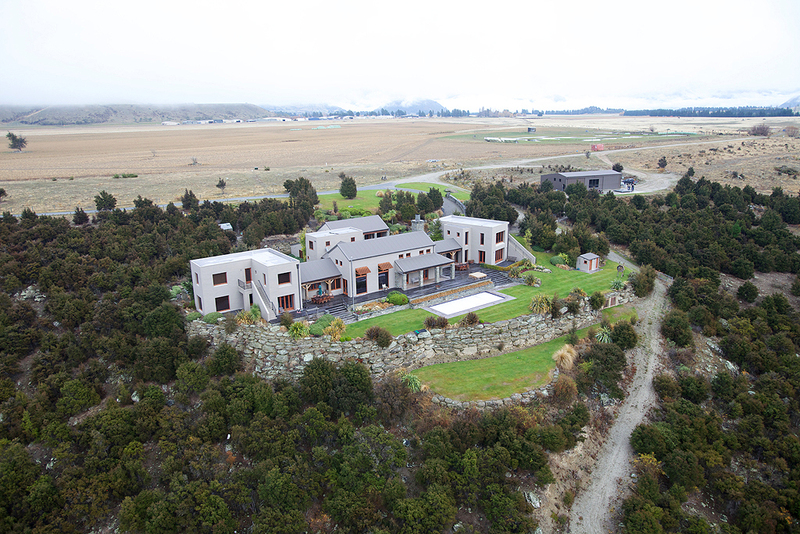 I’ve been waiting for this New Zealand write-up for awhile. Congrats on a great trip! Looking forward to hearing more about the hunt and performance of the new gear. Absolutely beautiful! Can’t wait to see and hear the rest. Is that the proto tent off by itself in the background of the tent picture? No it is not. My tent is around the corner from the orange one in the photo. More to come on the tents soon. Can’t wait to see it. Glad you’re pushing to innovate in every category! Awesome Jason. Wow what an adventure, next time I would like to see it with trad. archery equipment, but never the less, very jealous. Thank you Tim! I did wish for my longbow when I was there! Epic Adventures!! AWESOME PICS and STORY!! Thank You for EXCELLENT, QUALITY products!!! 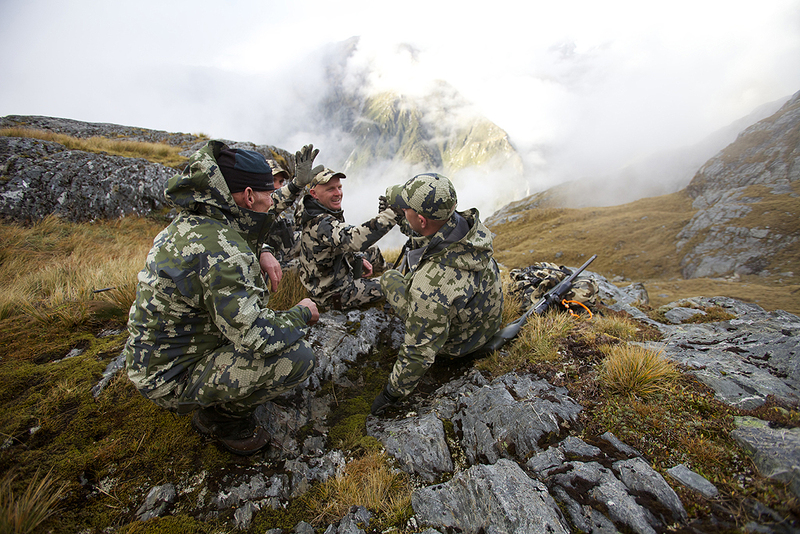 I was able to enjoy a South Central New Zealand free range Red Deer, Fallow, and Tahr adventure myself WITH GREAT KUIU GEAR this April 2013. Keep up the good work gentlemen!!! And THANK YOU AGAIN. Looks like a great hunt Jason. I noticed in the gear list you had a Kuiu sleeping bag. Is this a proto type for the one you will be producing for the rest us? How did it preform in the wet weather? I’ve been holding off on a sleeping bag purchase waiting for yours to come out. I live and hunt in British Columbia so the water proof down is going to be a must. Take care. It performed incredibly well in some really wet conditions. We had a lot of rain and fog and high moisture content. I also went to bed every night in my moist Merino Base layers because we had hard climbs back to camp to dry them out and had no issues. I just spoke to Lance Kronberger and he just came out of Spring Grizzly season and wore the Super Down for 30 straight days and nights and swears by it. Testing, Data and real world results continue to deliver on this technology. I did mis quote the bag weight on my spread sheet. The 30 Degree Prototype weighs 22oz not 32oz as I published on the Spread Sheet. Great feedback Jason. I will definetly be on the list for the per order of this sleeping bag. The tent sounds promising as well. Keep the inovation coming. 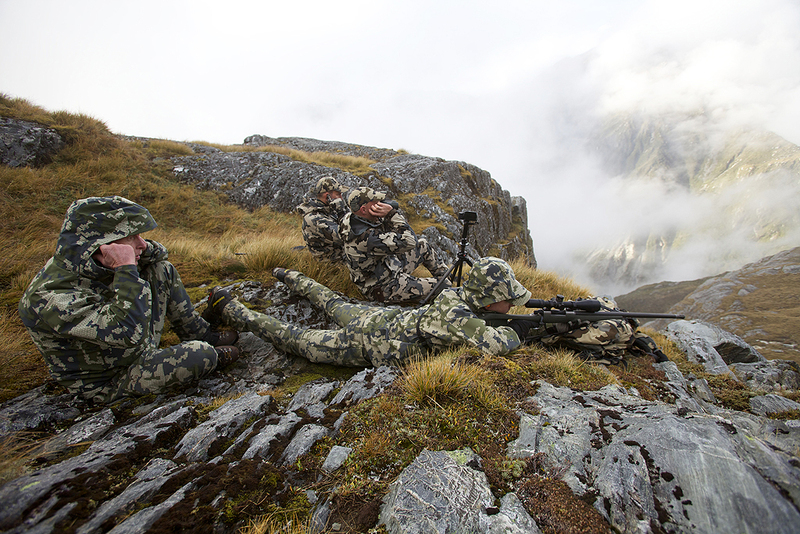 Looking forward to the second part of the NZ hunt. Looks like an amazing hunt- congrats! What kind of temps would you feel comfortable running the Yukon pant in as your sole outer layer. 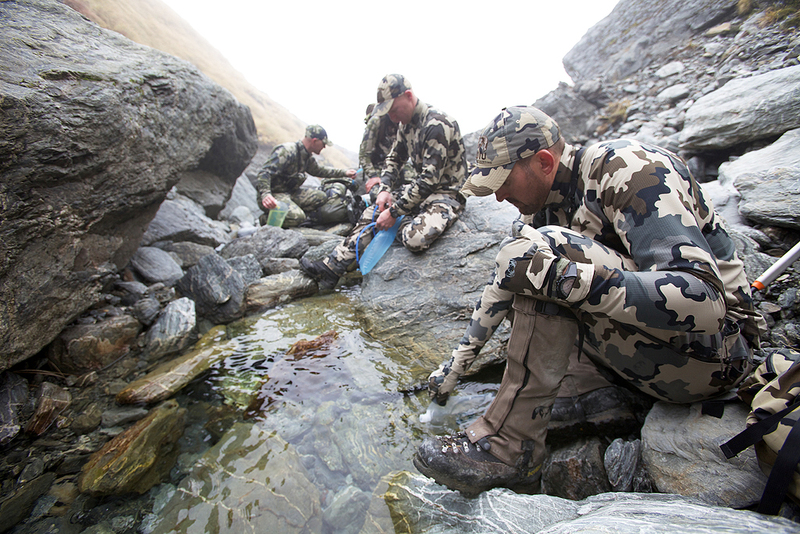 I am wondering if they would be too warm for my upcoming Dall sheep hunt in Alaka this year? Hey really nice pictures. 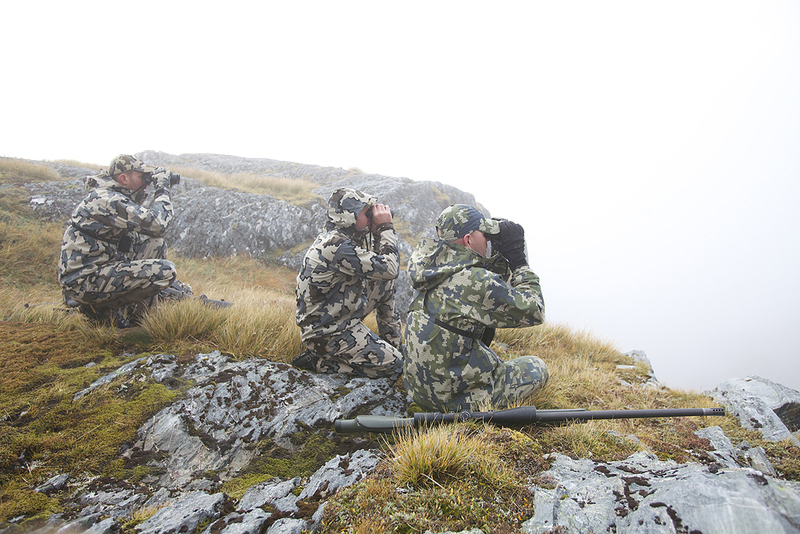 I’m been hunting thar in nz for 12 weeks the last two years. 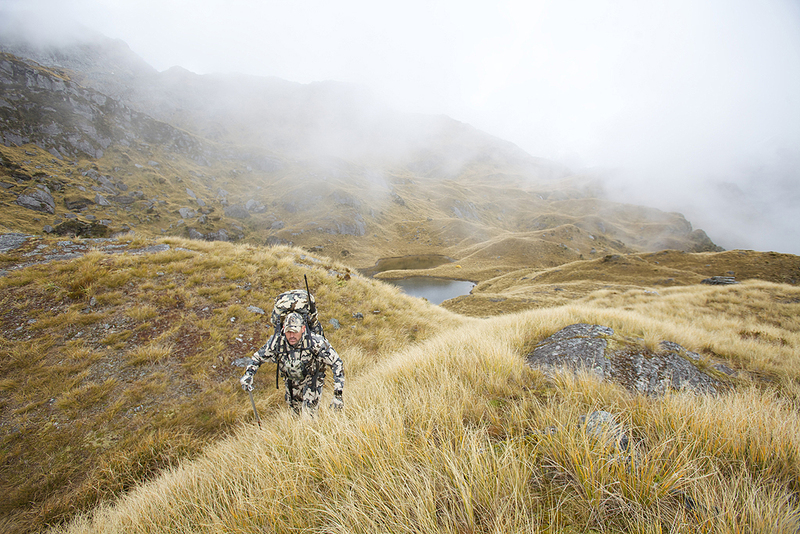 This is the ultimate place for hunting. It’s really good numbers of animals, you wil find good trophys on public land, and the hunting itself is really the best. I have shoot 35 thar On my trips down there. 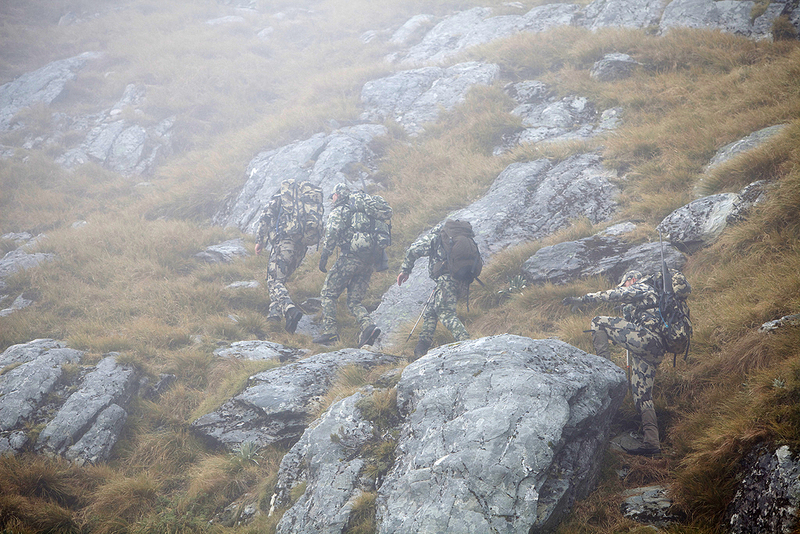 It’s a really hard terrain to hunt in, and the kuiu gear is really performing well there. I’m probably the first in Norway with kuiu gear. 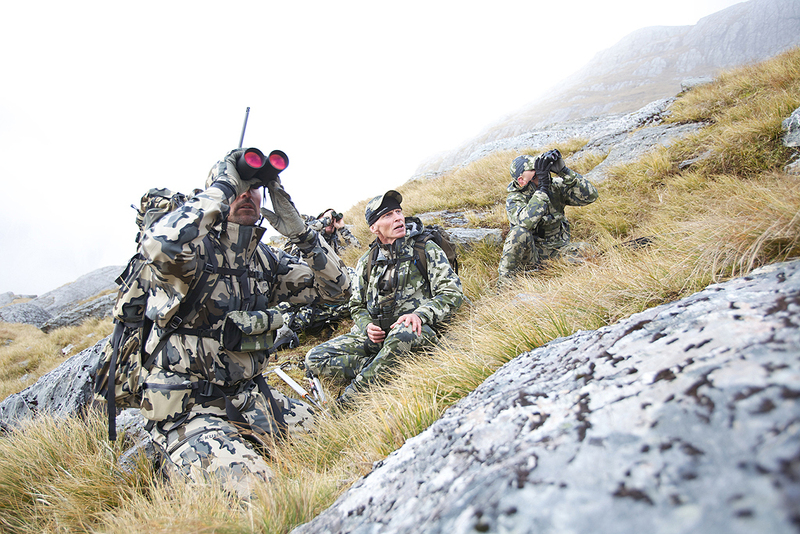 The vias is the perfect color for mountain hunting for reed and reindeer. Beautiful county and great write up and photos. Can’t wait to read the rest. 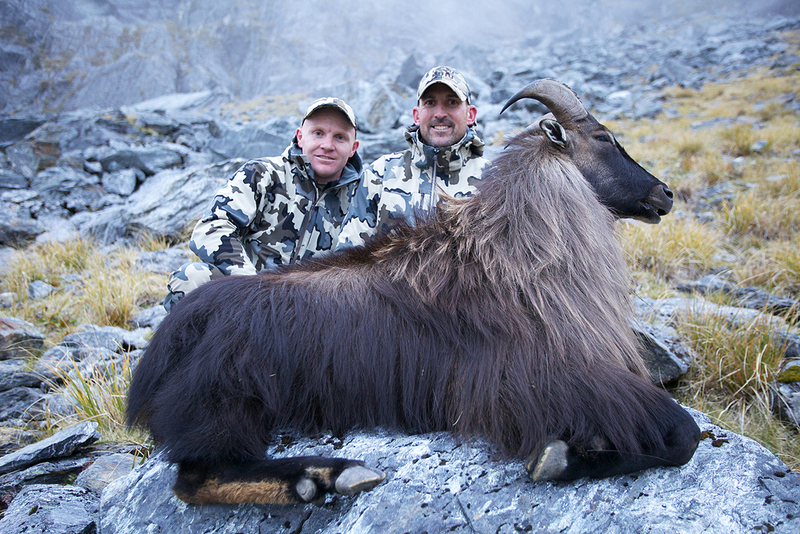 Spent a month there last year and hunted red stage and Arapawa rams on the North Island and I hope to go back soon. hi, any plans to for your little dry bags to be in your store again in the future?? Jason, your spreadsheet must have a misprint on the weight of the Boswell rifle too, right? Surely it can not be 30.1 oz all in! Yes this is a typo. My Rifle with scope weighs just over 6 pounds. Any more word on the Zamberlan boots? In need of a new pair and want these ones. Yes, they exit the factory in 2 weeks. I takes about 5 weeks plus customs to have them ready to ship. No later than mid-November. My opening order was only 500 pairs so please place a pre-order right away as we expect to sell them out pretty quickly. We will make an announcement next week with all the details. This boot is really something. Great Pics and story Jason. What kind of trekking poles do you like using? Or is that something that’s in Kuiu’s future too? 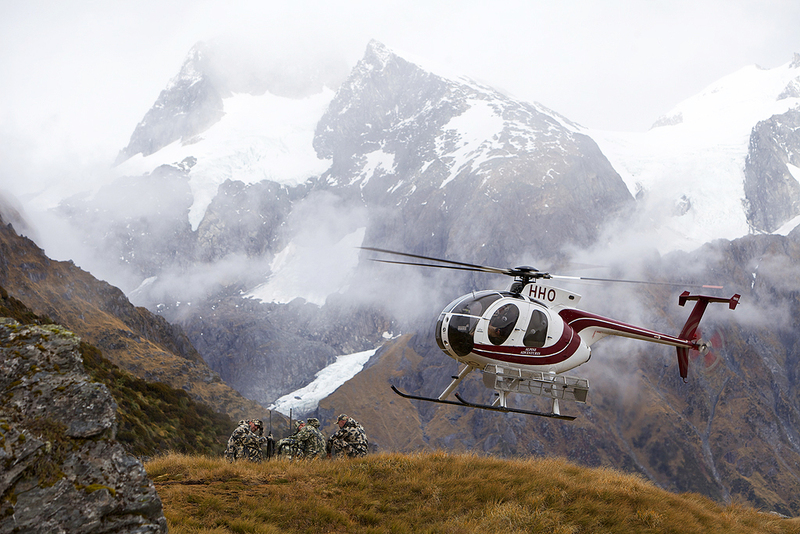 Are those big Red Stag in New Zealand on your list for your next trip over there? Thank you for story and pictures, last was aspecialy awesome. 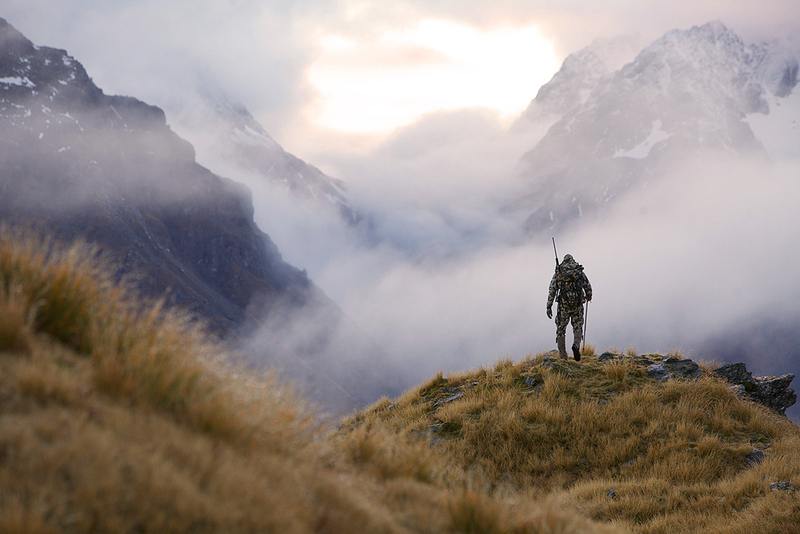 Jason, great story and fantastic pictures in New Zealand. 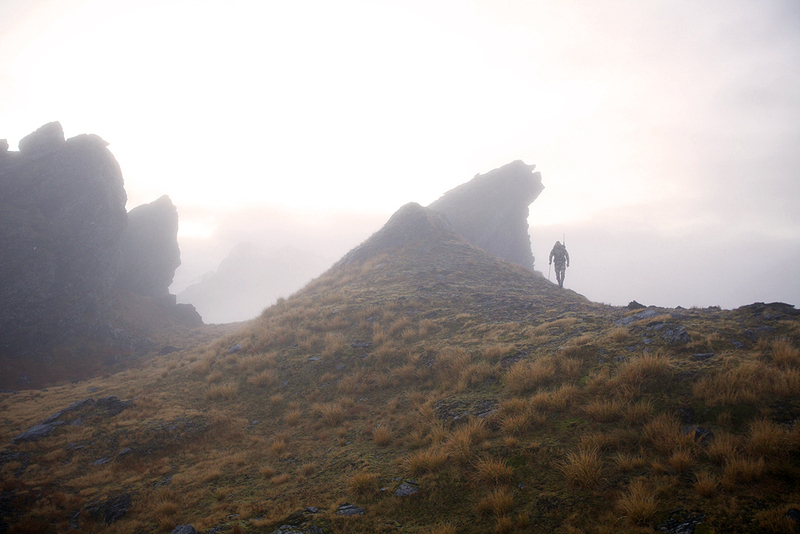 I have always wanted to go on a dream hunt to New Zealand, and seeing your photos makes me want to go even more. 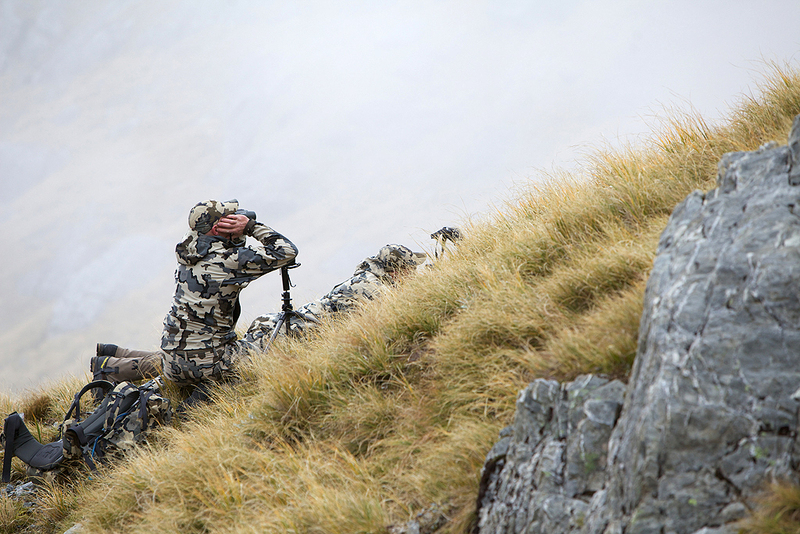 I will get there before I am too old to hunt. Keep on posting your great hunts and keep on making awesome hunting gear. I love all of the Kuiu gear that I have and I keep on getting more. Well this is living the dream. Great story and stunning photography, thanks for sharing it! Hey Jase. Glad you enjoyed your time in my back yard!! 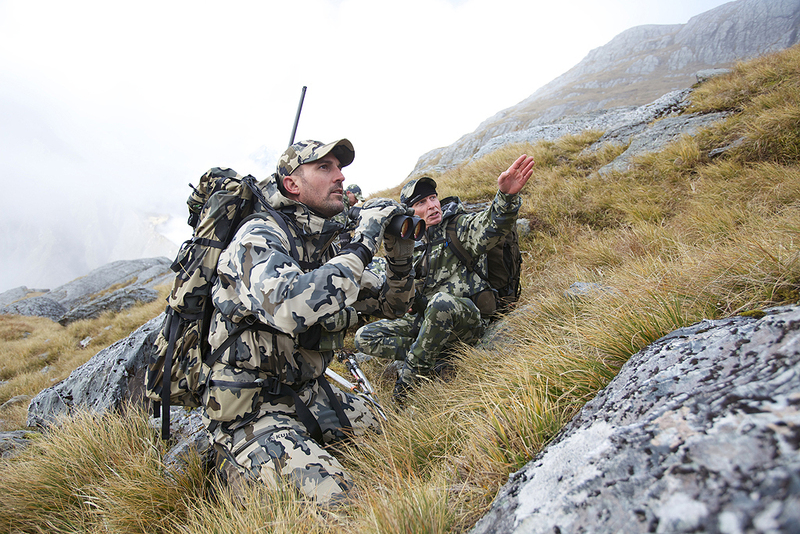 Looks like you’ve barely scratched the surface of what hunting here in NZ can provide and is all about. I have just back ordered your Yukon jacket which I see you wore on this trip. How did you find it stood up to kiwi conditions? The weather and terrain here is so changeable I was really looking for a jacket to cover most bases, be it southern alpine to wet northern bush. Can’t wait to compare it to the local gear here! The Yukon is a great option for NZ and it performed flawlessly while on my trip there. Great to hear. Thanks Jason. Glad you enjoyed your trip down here!